Jussie Smollett is an innocent man. In a stunning turn of events, all charges related to the gay Empire actor allegedly filing false police reports and staging his own hate crime attack in January have been dropped. “After reviewing all of the facts and circumstances of the case, including Mr. Smollet’s volunteer service in the community and agreement to forfeit his bond, we believe this outcome is a just disposition and appropriate resolution to this case,” the Cook County State's Attorney's office announced in a Tuesday statement. 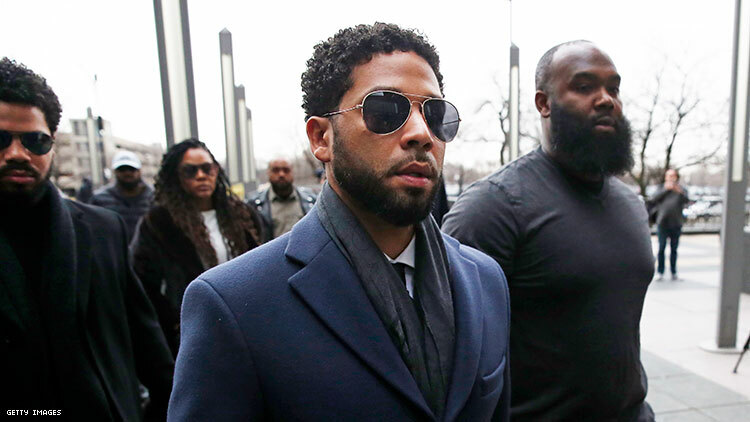 Smollett’s record will now be wiped clean of any filings against him, according to prosecutors. The actor will also no longer face any charges by the Chicago police department or the state of Illinois related to this case. The actor made a brief comment to the press and fans inside a Chicago courthouse after meeting with prosecutors. He stressed that he was “100 percent consistent” in his story the entire time, and was deeply thankful to those who supported him throughout the case. Smollett also stressed that he would never fabricate a story of this magnitude as an activist because he is aware of the damage it could do to LGBTQ people, Black people, and other minority communities. This latest development in a fast-moving case that began on January 29 has sent a shockwave through the city and law enforcement teams who have been investigating the case most closely. Police superintendent Eddie Johnson — who previously held a dramatic news conference and argued that Smollett was guilty of faking his own hate crime — was visibly angry at a public police event happening as today's news broke, according to sources. Johnson is expected to give remarks at Chicago’s Navy Pier on the results of the case, alongside Mayor Rahm Emanuel. Previously, the two officials both appeared on primetime television where they ridiculed Smollett for allegedly lying about being attacked. Smollett’s defense team is now using this treatment as a prime example for why Chicago police should not use the media as a way to “charge” people like Smollett. "Jussie and many others were hurt by these unfair and unwarranted actions. This entire situation is a reminder that there should never be an attempt to prove a case in the court of public opinion," Smollett attorney Patricia Brown Holmes said. "That is wrong." Smollett’s defense team would not comment on if charges will be filed against the two brothers who cooperated with police in the investigation into Smollett’s incident. Both the Chicago police and State's Attorney's office were asked for comment, but neither responded at the time of reporting. Abel and Ola Osundairo previously told police that they staged an attack on the actor the night of the incident. They were originally arrested on aggravated battery charges but released after interrogation, according to police arrest records obtained by The Advocate.